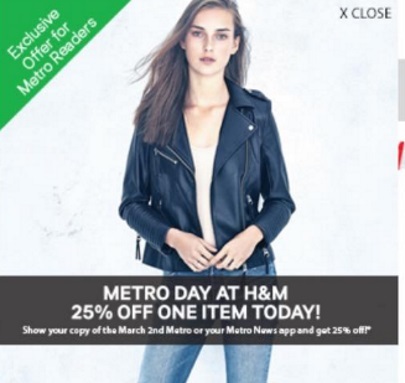 It's Metro Day at H&M today! Get 25% off one item when you show the coupon! Show your copy of the March 2 Metro newspaper or your Metro News app and get the discount. Offer is valid Thursday, March 2, 2017 only. Not valid online or on sale/discounted merchandise.